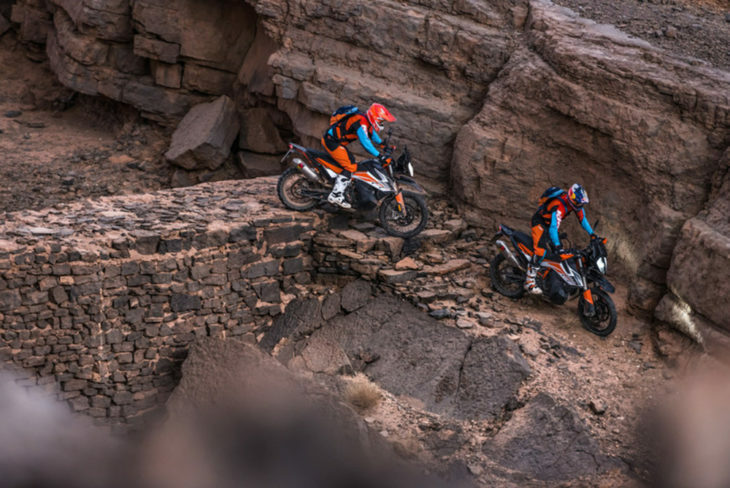 2019 KTM 790 Adventure and 790 Adventure R First Look—It’s been a long time coming, but we’ve finally been given the green light for KTM’s 790 Adventure series. 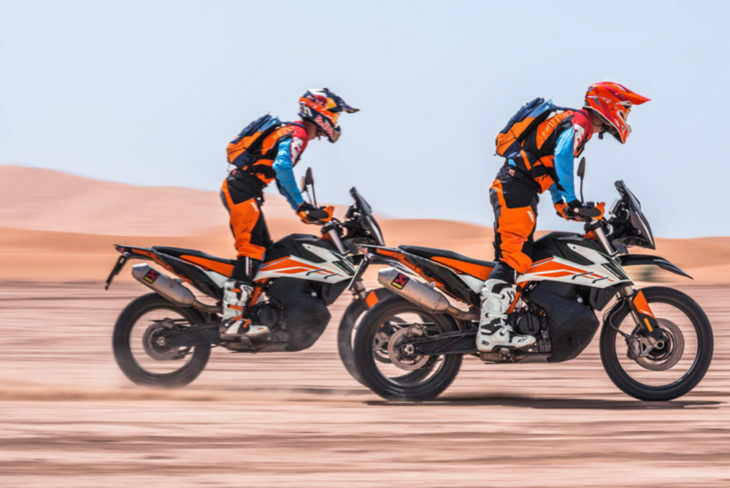 And for 2019, we’ll be getting two new machines in the more road-focused 790 Adventure and the full house off-road beast in the 790 Adventure R.
Both bikes share the same engine in the 799cc DOHC parallel-twin. 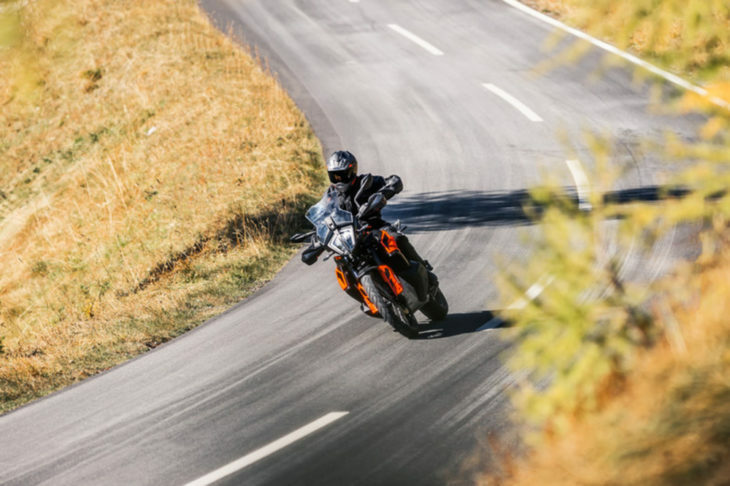 KTM hasn’t provided any power figures for the LC8c motor, but expect somewhere in the region of 95 hp on tap, with both machines weighing a claimed 416 lb dry. The two bikes differ in the obvious like bodywork and headlight, but also suspension. The base model gets WP’s 43mm APEX open cartridge upside down fork and WP APEX shock absorber with adjustable preload (both ends with 7.87 inches of travel), while the Adventure R gets beefier WP 48 mm XPLOR upside down forks with split function technology for more rugged off-road use, and the WP XPLOR PDS rear shock, for 9.5 inches of travel front and rear. 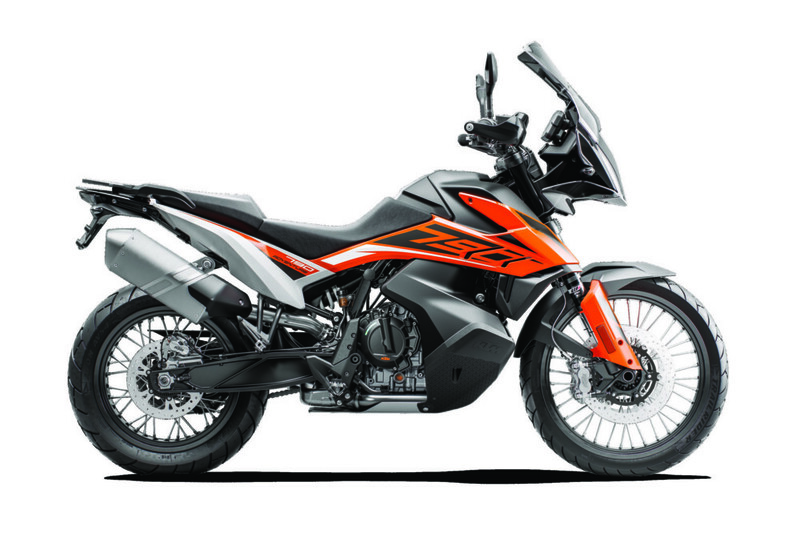 The base and R models both roll on 21-inch front and 18-inch rear wheels with more off-road focused rubber standard on the 790 R.
The same electronics are also found between the two bikes in the TFT dash, traction control, four riding modes of Street, Off-Road, Rain and the optional Rally mode, Motor Slip Regulation and Cornering and Off-Road ABS. To say we’ve been itching to ride the 790 Adventure series since we heard about it would be the understatement of the year. Expect these new weapons on dealer floors at the beginning of the second quarter next year, although KTM couldn’t confirm exactly when or what price these bikes will garner. 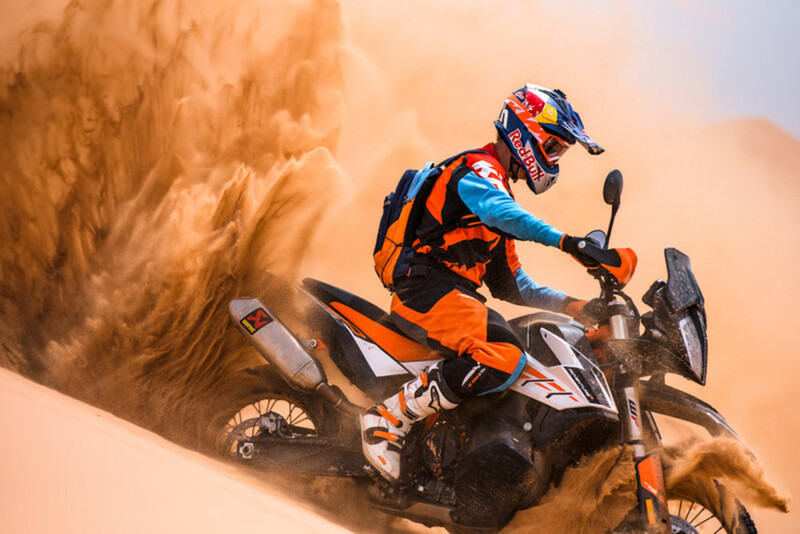 The 2019 year looks like it’ll be a big one for KTM ADV riders the world over! Extremely powerful parallel twin, 4-stroke, 799 cc DOHC engine with electronic fuel injection, dual balancer shafts, PASC slipper clutch and Ride-by-Wire for a smoother and more refined response. Ultralight tubular Chromium Molybdenum steel frame with the engine as a stressed member to reduce weight and overall size. WP 43 mm APEX open-cartridge front fork set with split function technology that separates the compression and rebound damping for excellent response and stability. 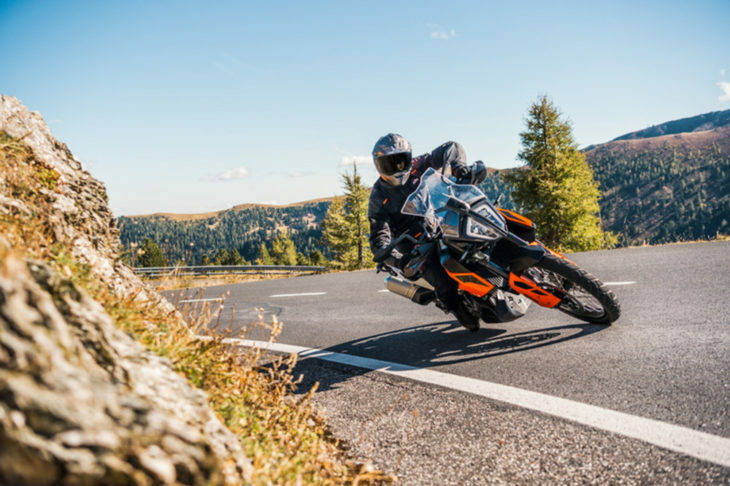 WP APEX shock absorber with adjustable preload is set up for traveling long distances in tough conditions, balancing typical KTM performance with all day riding comfort. Spoked wheels with a 21” front and an 18” rear for excellent offroad capability. A slim platform with a low-slung fuel tank to lower the center of gravity and allow the rider freedom of movement. Twin 320 mm front brake disks with 4 piston radially mounted calipers, Cornering ABS and Offroad ABS allow for an ideal mix of control and stopping power. 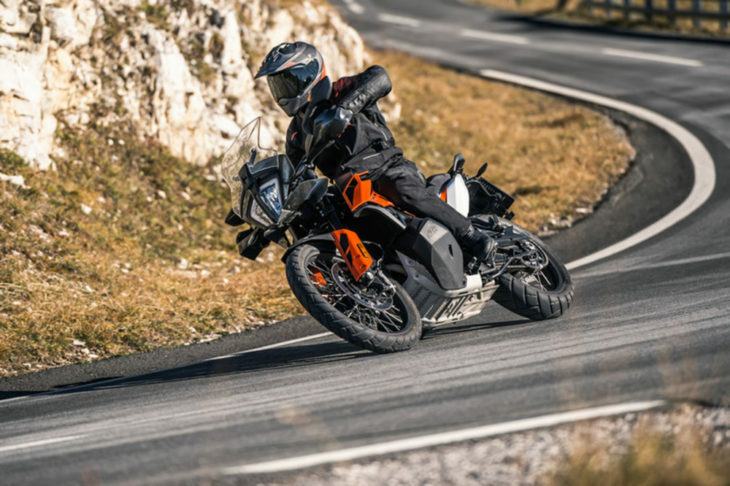 Rider aids include Street, Offroad, Rain and optional Rally ride modes, motorcycle traction control (MTC), motorcycle slip regulation (MSR), the optional Quickshifter+ and KTM MY RIDE. Heated grips, heated seat and cruise control are also optional. LED headlight and taillight for great illumination and visibility. Multifunctional dashboard with full-color TFT display is bright and clear. The display’s configuration is variable and automatically adapts to variations in environmental light. A tall windscreen, height-adjustable 2-piece seat, and handguards are all standard. Steering damper fitted as standard and set up to feel as natural as possible, giving the rider a secure feeling while keeping the agile riding character of the bike. Tapered aluminum handlebar can be mounted in 6 positions on the triple clamp resulting in 30 mm of adjustability. The fully-adjustable WP XPLOR 48 mm fork is the absolute best suspension currently offered on any adventure bike. Originally developed for Enduro riding, it is fitted with a spring on both sides and features separated damping functions for each fork leg for outstanding response and damping characteristics. The WP XPLOR PDS rear shock uses KTM’s trademark progressive damping system, which allows progressive damping without using a linkage for reduced weight and maintenance. 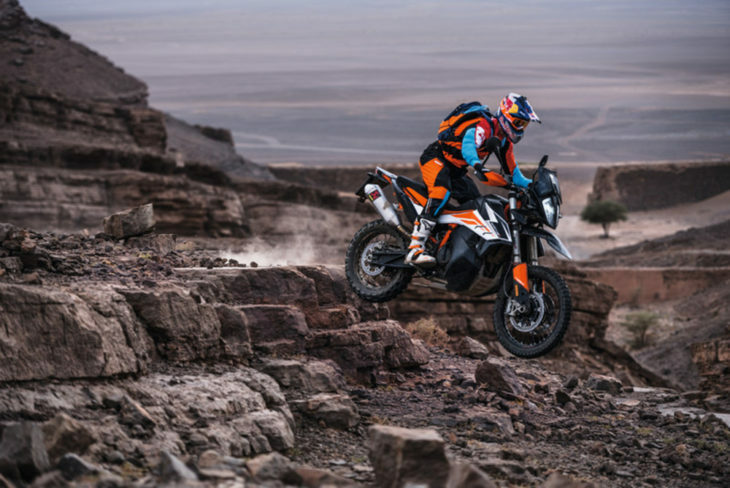 Rider aids include Street, Offroad, Rain and Rally ride modes, motorcycle traction control (MTC), motorcycle slip regulation (MSR), the optional Quickshifter+ and KTM MY RIDE. Heated grips, heated seat and cruise control are also optional. 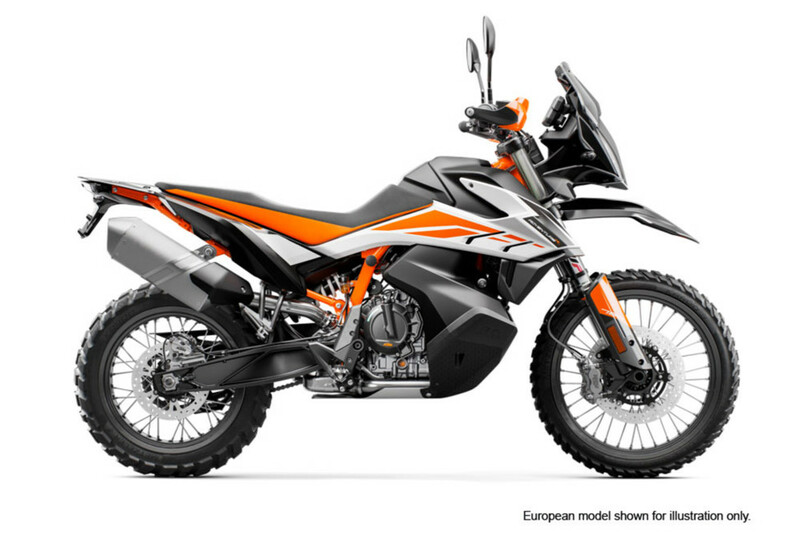 Features an offroad setup including handguards and a one-piece seat for an easy range of motion. Steering damper fitted as standard and set up to feel as natural as possible, giving the rider a secure feeling while keeping the offroad character of the bike.